In a special legislative session this week, North Carolina legislators moved to alter a state supreme court election in which incumbent Republican Associate Justice Barbara Jackson is facing Democratic attorney Anita Earls, and attorney Chris Anglin, who was a registered Democrat until June, but recently switched his party and filed as a Republican. There was no primary between Jackson and Anglin because the legislature cancelled this year’s judicial primaries. According to The News & Observer, Republican leaders “fear Anglin is a secret Democrat who’s only pretending to be a Republican to split the GOP vote and turn the court’s 4-3 liberal tilt into a 5-2 advantage.” On Tuesday, the Republican-controlled House and Senate approved a bill which would omit the party affiliation of any judicial candidate who changed his or her party 90 days before filing; this would remove Anglin’s Republican label on the ballot. While both bills will go to Gov. 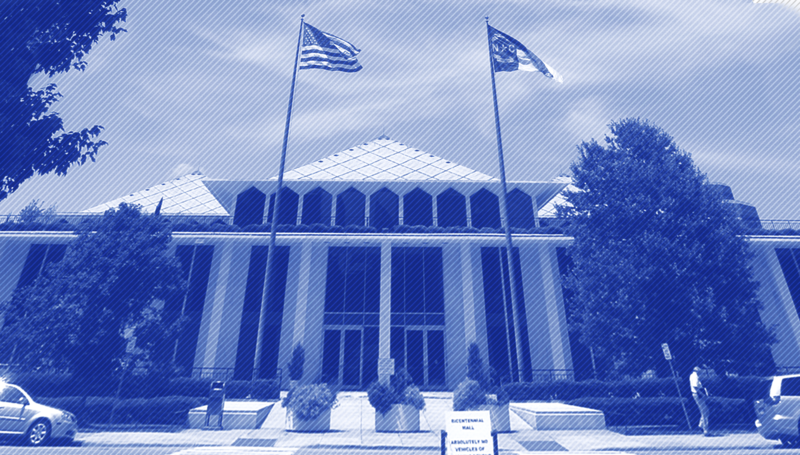 Roy Cooper for his signature or veto, Republicans hold a veto-proof supermajority in the legislature. This week, the Brennan Center for Justice launched a new initiative tracking all television ad spending related to the nomination of Brett Kavanaugh to the Supreme Court. On its webpage, “Follow The Money: Tracking TV Spending In The Fight Over Trump’s SCOTUS Pick,” the Brennan Center will make available information about the cost of individual ad buys, spenders’ identities, target markets, and more to highlight the large amount of dark money fueling the nomination fight. The tracker uses data provided by Kantar Media/CMAG, which captures ad data in the nation’s largest media markets. As of July 27, 2018, the largest spender is the Judicial Crisis Network, a dark money organization which has already spent over $800,000, and has said it is “prepared to spend as much as $10 million” on pro-Kavanaugh ads; JCN previously spent $17 million to block Merrick Garland’s nomination and support the confirmation of Neil Gorsuch. Spending has been concentrated in a few key states: Alabama, Alaska, Indiana, Maine, North Dakota, and West Virginia; and often target Senators up for election this November. This work builds upon the Brennan Center’s annual tracking of spending in state supreme court elections, which is ongoing for fall elections. On July 10th, President Trump issued an executive order granting federal agency heads significantly greater discretion in selecting federal Administrative Law Judges (ALJs). Previously the independent Office of Personnel Management required agencies to choose ALJs from a short list of vetted candidates who performed well on a competitive examination. In response, Democratic Representatives filed an amendment to appropriations legislation that would prevent the Office of Personnel Management from using agency funding to enact regulations carrying out the executive order.